I started this back in mid-March. At first I had a good amount of the blocks very carefully arranged on my sewing room wall. Then over the last few weeks they started to fall. For awhile I tried to put them back where they belonged, but that process was never-ending. I gave up and proceeded to roll over the fallen blocks with my sewing chair until I could will myself to at least stack them up in a safe place. So when I finally started sewing them together, I ended up doing it fairly randomly, just trying to balance out the colors as best I could. It measures 52" x 56". My original plan was a 14 x 14 square configuration of 196 blocks. But when I realized the design would be assymetrical, I cut out a column and used only 182 of them. Confession of a lazy quilter-- although I should have trimmed those 182 blocks to perfect 4.5" squares, I left them alone! I didn't even trim the little dog ears that come off the triangle points! Yet just about every corner lines up, the quilt top is fairly square as far as I can tell, and the seams aren't bulky. Oh, and I kept my sanity. Laziness wins! As I've mentioned before, the Oakshotts were a dream to use. 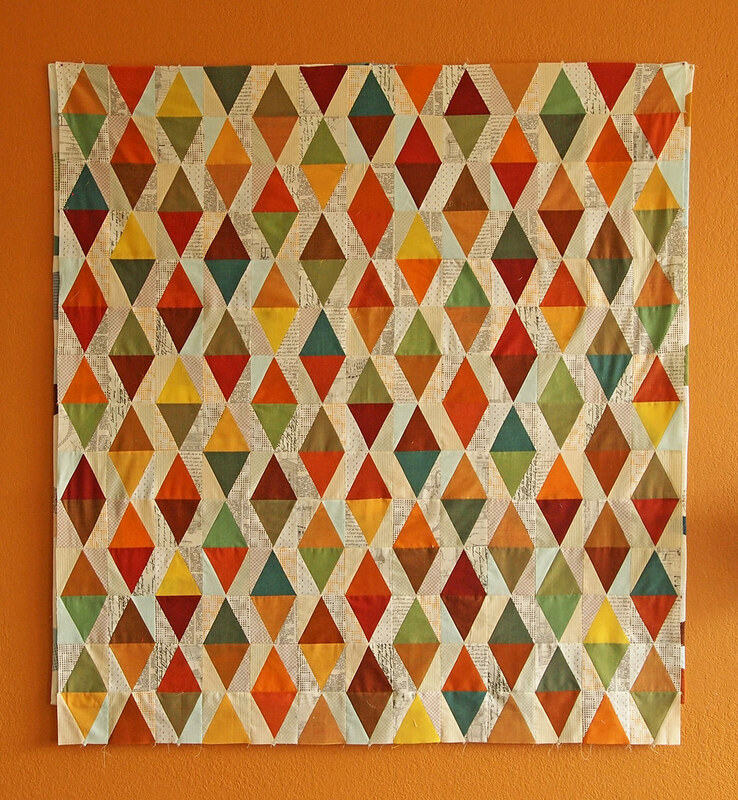 The colors are so rich and beautiful, and the fabric is pretty stable (important when sewing triangles). While I loved these fabrics from the Autumn bundle, I'm itching to play around with some of the other colors soon. I may end up ordering the Sunrise bundle or some individual blues, greens, reds, purples, and pinks. I also really want to try their neutrals. Hmmm. Maybe I should just save for the ColourBox? This is sooo very pretty! And it looks like you painted the wall to match - perfect! This is just stunning in its simplicity! What a cozy quilt this will be for Autumn! well by your standard Krista, im a very lazy quilter, because I often let those little things slip! so glad it worked out for you! I have a confession. I never, ever, trim dog ears. The quilt top is gorgeous. This is so pretty. Love the variety of neutrals. Super dooper incredible gorgeous. Why have I never sewn with a single ever loving shot cotton? It's blasphemous. Hey girl, when are you gonna have that baby? Getting close right? Well, I love my colour box. 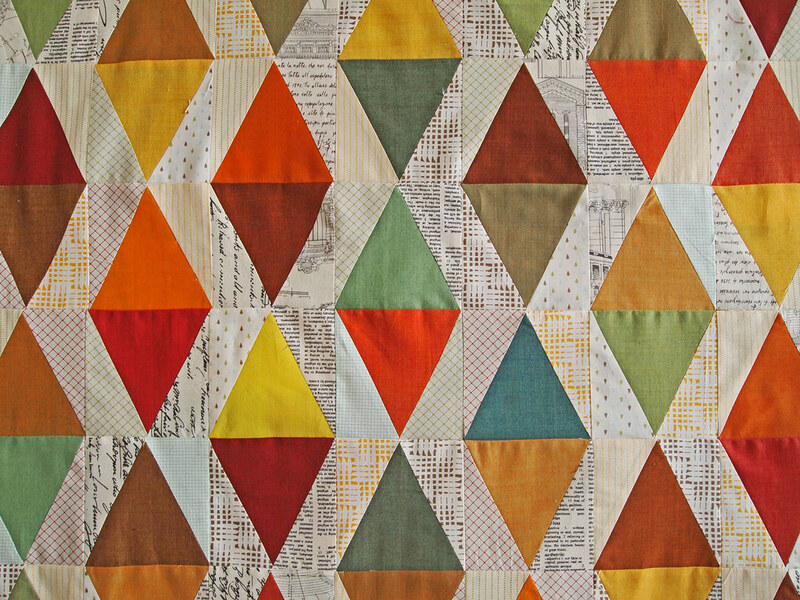 Your quilt is looking wonderful, I love the solids with the text and other neutrals. It looks amazing! I love all the little grid and writing prints interspersed between the oakshot cotton solids. Oh, how I love this! I swear, whenever I see your bright orange wall pop up on my blog reader, I know it's going to be something spectacular. Beautiful work! Love those neutrals. I love this! What a great way to mix solids and prints. Beautiful! I love that you didn't drive yourself crazy making it and it came out great! Wow, I saw this one flickr and now here, I love it! Very, very nice. I absolutely love this! The text prints in the background are fantastic! I see a color box in your future. Because I think you are running low on fabric right? Beautiful! Love the colours and the background fabrics! And I think you should go for the colour box. If you don't use the fabrics you can hang the whole thing on the wall as Art. It is too scrumptious for words!! Wow, no kidding? The oakshot is stable-- that's Good to know! 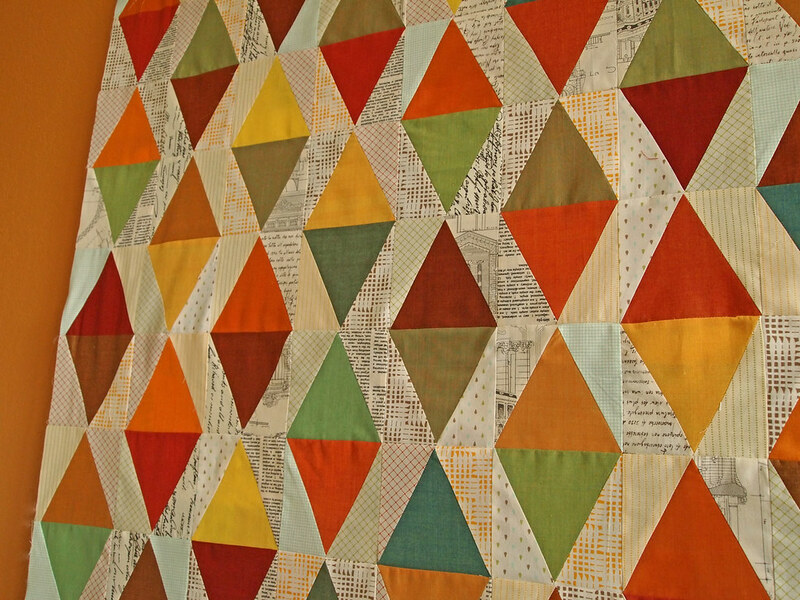 I love how this quilt sings, love the solids with the text and almost texts! well, look at that! i love it krista! beautiful work! I love all the text prints in the background! I'm curious about these Oakshots. They look beautiful in your quilt.